Though its roots trace back to the Super Nintendo, the modern Earth Defense Force saga is one of the few surviving members of the Sony-exclusive “Simple Series”, a collection of intentionally low-budget titles from D3 Publisher. The production budget has obviously risen since its PS2 days, but the recent and last-gen installments retain the comical charm of decimating entire cities and sending alien limbs hundreds of meters in every direction. 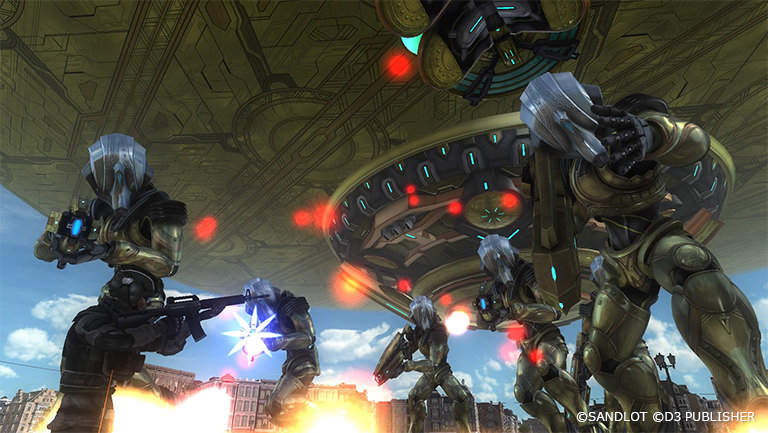 Following 2015’s Earth Defense Force 4.1: Shadow of New Despair, Earth Defense Force 5 serves as a series reboot, setting 2022 as the start of a new timeline in which the EDF is a private military organization, as opposed to a global defense league: In this new continuity, the planet is suffering the first of many attacks by aliens from not just the stars, but beneath Earth’s crust, as once-dormant gigantic insects have begun to emerge. Players embark in either solo or co-op large-scale sandbox missions with various EDF classes, each with his or her own unique perks, including heavy artillery, vehicle combat, and air-maneuverability. Weapons and upgrades are acquired and permanently included over the course of the 110 Missions, however players are free to equip and adjust their soldier’s equipment as needed for each level. Earth Defense Force 5 released exclusively for Japanese gamers in late December 2017, however Sony and D3 Publisher have since confirmed the title will see a North American release for the PS4. The latest trailer- and first one presented in English- serves as a brief, albeit chaotic primer to the new EDF storyline, with the world under siege from giant fire ants, spiders, alien drop-ships, mechs, and other B-movie science-fiction kitsch. Earth Defense Force 5 is currently available to pre-order in North America for the PS4, but an official release date has not been set. The previous installments, Earth Defense Force 4.1: Shadow of New Despair and it’s Shoot-Em-Up spin-off Earth Defense Force 4.1: Wingdiver the Shooter are available for PS4 and PC via Steam. A more serious, story-driven take on the franchise, Earth Defense Force: Iron Rain is scheduled to release in 2019.